2300 PSI BRUSHLESS ELECTRIC PRESSURE WASHER is rated 4.7 out of 5 by 399. Rated 4 out of 5 by rachelrph from Replacement Washer I bought this washer to replace a Karcher model I purchased more than 11 years ago. This Ryobi model is 2300 psi and the Karcher one I replaced it for was 1300 psi. I had started cleaning a spot with the Karcher model when it went out. I went over the same area with the Ryobi model and it got dirt off the Karcher model missed. The reason for my 4 star rating is that the pressure hose on the trigger handle is hard to wind up to put away and I was especially unhappy that the trigger handle did not have a lock feature on it. My hand was fatigued in short order by having to keep the handle down the whole time instead of locking it. Rated 5 out of 5 by Tenntom1 from Great features I originally bought the 2000 psi unit then bought the 2300 to see how they compared. I returned the 2000. I liked the larger wheels and increased pressure of the 2300 and how the power cord and water cord wrapped up on the handle. I can leave the water cord attached to the wand and the machine when not in use. It does have a continuous motor noise...less when the wand handle is not depressed, and I didn't find annoying. I purchased the longer 27"wand because I'm 6'3" and don't have to bend over as much. I also bought additional nozzles so I'm good for a variety of uses. I've only had it 2 weeks but am very happy with this unit. Rated 5 out of 5 by EricD from As advertised I bought this unit after borrowing a friend who had the 2000 psi version. His did a good job for what I was borrowing it for. Cleaning vinyl siding, patio and shed. The 2300 psi version is a newer version and I figured what could be different but a few extra PSI. Well I wasn't disappointed with the unit itself nor the pressure. I was a little confused on why they didn't put the hose reel on this version like the 2000 psi version. That wasn't a deal breaker vs getting a few extra psi. For an electric pressure washer this unit is a great buy. I have already recommended it to a few friends and neighbors, 2 of which have already purchased the exact units. Rated 5 out of 5 by bdobyns from First Pressure Washer Purchase For the price, it is one of the best ELECTRIC pressure washers available. I was concerned that the low PSI would not be enough. Turns out the 2,300 PSI model would be more than enough for my basic needs. I was surprised by how little noise was created by the unit compared to a gas motor. At first, it sounds a little rough, but after the pressure is built up, it really quiets down. More of a background hum than the sound of a lawnmower. Even when cleaning, the noise level is very low. Overall, I'm very pleased with the purchase. It has met all of my power washing needs so far. Just need to get some more attachments as 2 aren't enough. Rated 5 out of 5 by Randy SF from Excellent for average suburban home Opted for this vs. a gas model based on favorable reviews. It hasn't disappointed. 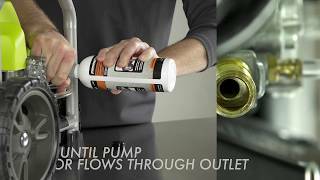 With two cleaning nozzles and a detergent nozzle, it's versatile. The turbo nozzle is great for cleaning concrete and the regular one works fine for a composite deck. The machine is much lighter weight and quieter than gas models. Very easy to set-up and use. There's enough power with the turbo nozzle to clean concrete, it just might take a little longer than a higher powered gas model. If you use power washer a few times per year, you're ok dealing with the electrical cord, and don't need to stray too far from outlet, this model is a great choice. Rated 5 out of 5 by AnnS from No Leaks!! I recently purchased this power washer after a terrible experience with another brand. I am a 73 year old woman and had no difficulty putting the power washer together or using it to clean our stone porch and patio. It is nothing short of fabulous--did everything easily and unlike our prior bad experience there were no leaks. The three included nozzles worked perfectly and everything stores on the unit so it's easy to put away and set up for the next use. Wish I had bought this one sooner! 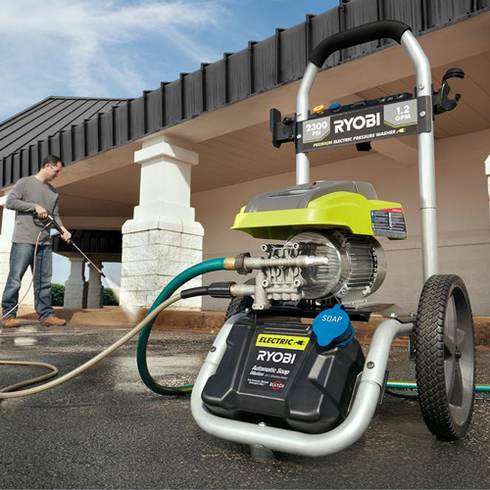 The RYOBI 2,300 PSI Brushless Pressure Washer is engineered to handle the toughest jobs. This pressure washer features a 13 Amp High Efficiency Brushless AC Induction Motor and a Gas Pressure Washer Style Axial Cam Pump. It is exceptional for quick cleaning of driveways, decks, windows, patio furniture and other areas around the house. This unit also includes a Turbo Nozzle that delivers up to 50% faster cleaning. 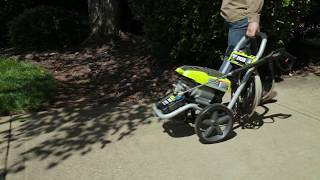 The RYOBI 2,300 PSI Brushless Electric Pressure Washer is backed with the 3-Year Limited Warranty and is guaranteed to deliver results for years to come.